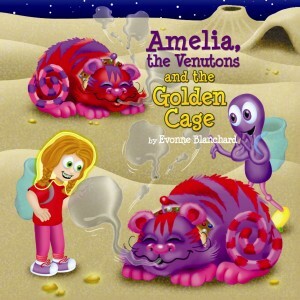 In Amelia, the Venutons and the Golden Cage, Amelia heads out to an adventure along with her friend, the alien Uglesnoo. Uglesnoo’s sister is sick, and the only cure is a crystal from Neptune, but if they want to buy the crystal, they’ll have to land on Venus first and get some bliss bubbles. Unfortunately, though, the inhabitants from Venus are anything but friendly – the Venutons want to stop them from getting their bliss bubbles and saving Uglesnoo’s sister. What a creative, original story! This is one of he first kids books I’ve read that features aliens, but it’s amazing. The illustrations are cute and colorful. Based on the amount of text, I’d say this is an excellent read for young readers aged six and up. For younger kids, parents can read it to them, and with the pictures, they’ll surely be entertained. A wonderful, entertaining space adventure. I look forward to the next book.